President Donald Trump meets with Palestinian President Mahmoud Abbas at the Palace Hotel during the United Nations General Assembly, Wednesday, Sept. 20, 2017, in New York. 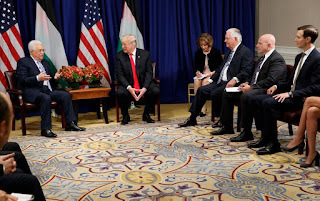 From left, Abbas, Trump, an unidentified interpreter, Secretary of State Rex Tillerson, National Security Adviser H.R. McMaster, and White House senior adviser Jared Kushner. NEW YORK (AP) — President Donald Trump said Wednesday he has made a decision on whether to walk away from the landmark 2015 nuclear deal with Iran but refused to say what it is, setting the stage for a particularly contentious meeting of the parties to the agreement. The meeting will be the highest-level U.S.-Iranian interaction of Trump's presidency and comes a day after he delivered a blistering attack on Iran and the accord at the U.N. General Assembly. Compounding the animosity ahead of the meeting, Iranian President Hassan Rouhani responded to Trump by calling his Wednesday speech "ignorant" and "unfit" to be heard at the United Nations. Trump, when asked by reporters about the nuclear accord, said, "I have decided." Pressed for details, he replied coyly: "I'll let you know." His comment and Rouhani's, came just hours before Secretary of State Rex Tillerson and Iranian Foreign Minister Mohammad Javad Zarif were to attend a European Union-hosted meeting about the agreement at the U.N.
A year ago, such a get-together would have been considered routine as nations strove to implement an agreement that curtailed Iran's nuclear activity in exchange for an end to various oil, trade and financial restrictions on the country. In the current environment, however, it is anything but ordinary. Addressing the General Assembly, Rouhani said his country won't be the first to violate the nuclear agreement "but it will respond decisively to its violation by any party." In a direct jab at Trump he said, "It will be a great pity if this agreement were to be destroyed by rogue newcomers to the world of politics." "By violating its international commitments, the new U.S. administration only destroys its own credibility and undermines international confidence in negotiating with it or accepting its word or promise," Rouhani said before taking aim at Trump's scathing Tuesday criticism of Iran. "The ignorant, absurd and hateful rhetoric filled with ridiculously baseless allegations that was uttered before this august body yesterday was not only unfit to be heard at the United Nations, which was established to promote peace and respect," Rouhani said. Trump had used his U.N. General Assembly speech to launch a withering critique of Iran, saying its government "masks a corrupt dictatorship behind the false guise of a democracy" and ruthlessly represses its people. "It has turned a wealthy country with a rich history and culture into an economically depleted rogue state whose chief exports are violence, bloodshed and chaos," he said, repeating a litany of oft-spoken U.S. complaints about Iran. These include its antipathy to Israel, support for terrorism and Syrian President Bashar Assad, ballistic missile testing and its nuclear program. "We cannot let a murderous regime continue these destabilizing activities while building dangerous missiles," Trump said. "And we cannot abide by an agreement if it provides cover for the eventual construction of a nuclear program. The Iran deal was one of the worst and most one-sided transactions the United States has ever entered into. Frankly, that deal is an embarrassment to the United States." Zarif, who had a friendly, collegial relationship with former Secretary of State John Kerry while they negotiated the nuclear deal, was quick to denounce Trump's speech. He took to Twitter to offer a glimpse of what may be in store for future exchanges with U.S. officials, including perhaps with Tillerson on Wednesday. "Trump's ignorant hate speech belongs in medieval times — not the 21st Century UN — unworthy of a reply," Zarif said on Twitter. "Fake empathy for Iranians fools no one." Trump has said repeatedly that he is inclined to not certify Iranian compliance after having twice found the country compliant at earlier deadlines. That could mean a return of U.S. sanctions on Iran that were suspended under the agreement. Such action could lead Iran to then walk away from the deal or restart some nuclear activities it curtailed two years ago. The rhetorical threats have worried the other countries in the agreement: Britain, China, France, Germany and Russia. The Europeans, in particular, have expressed their disapproval of Trump's threats and talked about trying to lobby the U.S. to abide by the accord. Iran rejects that it has broken the agreement, and a U.N. report this month pointed to no Iranian violations. Under U.S. law, the president must certify to Congress every 90 days whether Iran is adhering to the agreement. If the president doesn't certify compliance, Congress has 60 days to decide whether to re-impose sanctions. The next certification deadline is Oct. 15, and several officials and people close to the matter have described Trump as determined to "decertify" Iranian compliance with the nuclear deal at that point.